The parking of modular homes on borough streets is prohibited. The driver of a vehicle must stop and stay stopped for a pedestrian crossing the roadway within a marked crosswalk or within any unmarked crosswalk at an intersection, except at crosswalks when the movement of traffic is being regulated by police officers or traffic control signals. For rules, regulations, and application Click here. October 1st - April 30th Open 7 Days a week. We are proud to offer this new service to the public. An Emergency Notification System gives those in charge of Public Safety a chance to reach out to the public in case of an emergency event. “Register Ready – New Jersey’s Special Needs Registry for Disasters” allows New Jersey residents with disabilities or access and functional needs and their families, friends, caregivers and associates an opportunity to provide information to emergency response agencies so emergency responders can better plan to serve them in a disaster or other emergency. The information collected here is confidential and will not be available to the public. The information will be held securely and only used for emergency response and planning. The Lavallette Police Department would like to notify any resident who signed up to be on the "No Solicitation" List, to please contact the police department to place your name on the list. Unfortunately the list was not kept in digital form at the time of Super Storm Sandy and was lost in the storm. We apologize for this inconvenience, and encourage all homeowners who wish to be on the "No Solicitation" list to contact the Police Department to be placed on the list. Visit the Emergency Management Page for Hurricane preparedness information. When calling 911, Remember to stay calm, the 9.1.1. operator is there to help. Follow the instructions the 911 operator gives you. Wireless phones don't always automatically provide 9-1-1 call-takers with all the information they need. That's why, it's important to remember when calling 9-1-1 using a wireless phone, to give your location, nature of emergency, who is involved, and a phone number. We also suggest that you be aware of your surroundings. Look for landmarks. 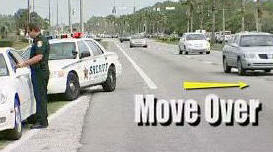 And, when driving, pull over to a safe place, and then provide as much information to the 9-1-1 dispatcher as possible. 39:4-92.2 Procedure for motorist approaching stationary authorized emergency vehicle, tow truck, highway maintenance or emergency service vehicle. This is the new law that requires drivers to veer away (to an outer lane) from police cars and other emergency vehicles stopped on the side of a road. If moving to an outer lane is not possible, motorists are required to slow down below the speed limit and be prepared to stop. The purpose of this program is to empower the local, private, and corporate waterfront community with the knowledge and ability to assist law enforcement. Civilians can assist by identifying observed criminal or terrorist behaviors, and alerting law enforcement. This information is then entered into the Statewide Intelligence Management System (SIMS). The SIMS database is used to collect and share information on suspected involvement in all types of criminal activity. SIMS allows agencies to store intelligence for their own use or for the use of the broader law enforcement community. "No wake" is defined as "The slowest possible speed required in order to maintain steerage and headway." In New Jersey, it is unlawful to operate any vessel or personal watercraft (PWC) at greater than "no wake" speed when within 200 feet or less of docks, marinas, piers, or wharfs. Vessel operators are responsible for any property damage caused by their vessels wake.